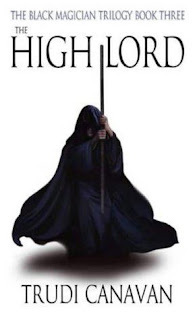 The High Lord by Trudi Canavan is the last book in The Black Magician Trilogy. In this book Sonea must deal with what black Magic she saw occur in the first book (The Magicians' Guild). Now she cannot hide from the terrifying truths her mentor, The High Lord wishes to share with her. I enjoyed this book as much as I enjoyed the first two in the trilogy, but I was sad to know that there wouldn't be another book in the series about Sonea.